Despite several miscues including back-to-back pick-6's in the first half, the San Diego Strike Force (0-4) had a chance to send the game into overtime in the closing seconds, but Derrick Bernard's pass was deflected in the end zone as time expired, resulting in 53-45 loss to the visiting Green Bay Blizzard (2-2). The Strike Force will have a another shot at ending their winless streak when they visit the Tucson Sugar Skulls in a rematch from Week 2. 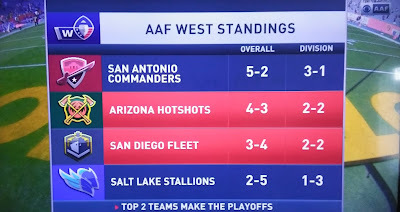 Nelson Spruce set an AAF single-game record with 12 catches, but the San Diego Fleet (3-4) are on the outside of the playoff picture following a 32-15 loss to the Arizona Hotshots (4-3). 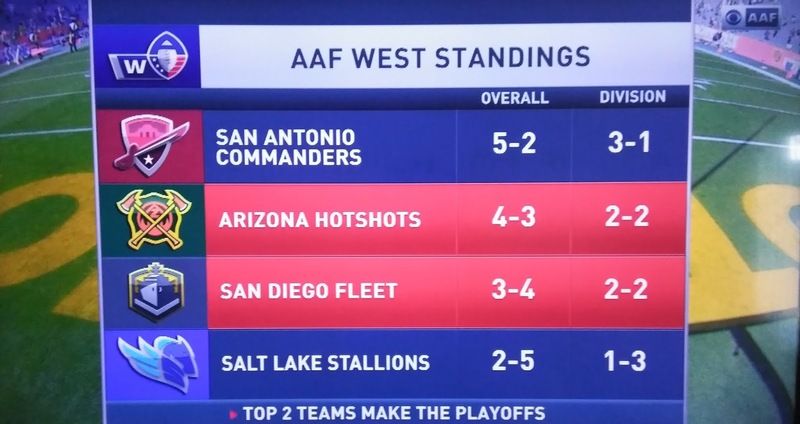 They continue their road slate this Saturday against the Salt Lake Stallions, a team they defeated with a last-second field goal three weeks ago.